What was the brief from the customer? 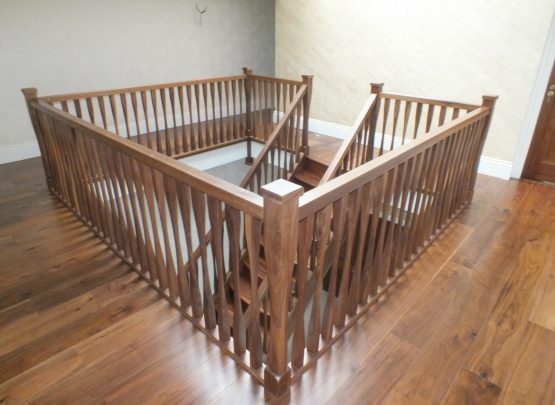 With this staircase the customer wished to have an imposing feature as they walked into the hallway. 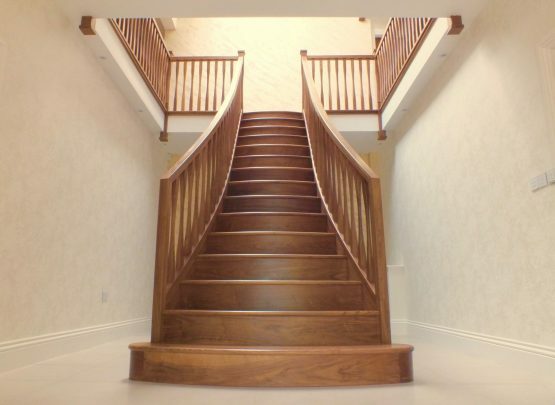 In order to achieve this there are two elements of the stairs that stand out. 1. The color. 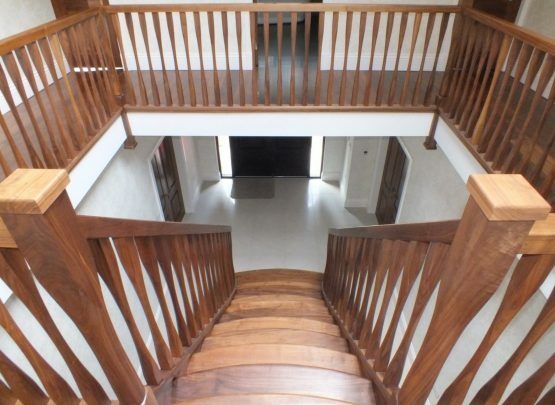 The dark walnut color of the stairs stands out so clearly against the walls. This makes the stairs pop as soon as you walk in. 2. The shape. The unique curved nature of the stairs, with both sides splaying out towards the outer walls, this draws the eye line up, and encourages people up the stairs. Where are the smaller details? The smaller details in this staircase are found in the first two newels. 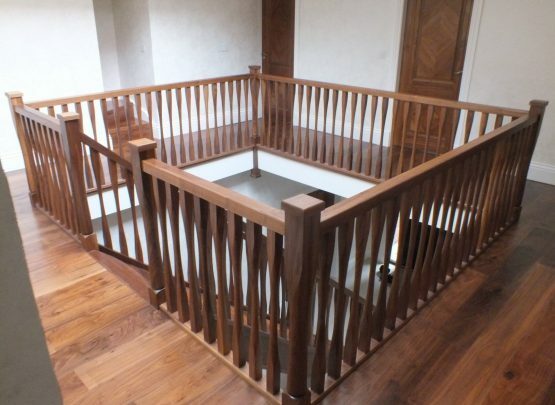 These newels are designed so that the handrail doesn’t meet into the side, but they are mitered into one another. This gives the appearance of one piece of timber as opposed to two. This prevents distractions as people are looking up the staircase and draws people’s attention more towards the curve. What style are the components? Newels: The first two newels are square, whereas the rest are slender. Spindles: All of the 150 spindles used are slender. Newel Cappings: The newels Cappings used on the landing newels are all minimal with a pencil round on the edges. Under-Paneling: Walnut boarding with minimal detail was used on the rear side of the staircase. 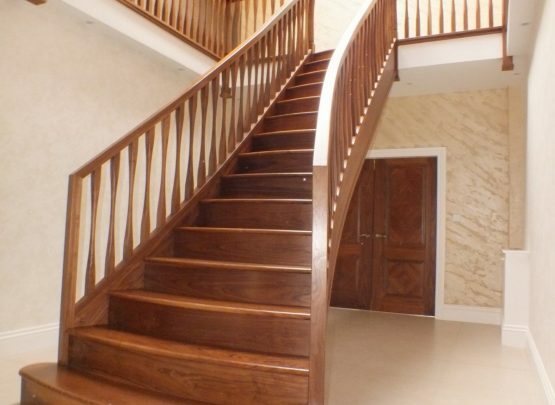 Treads: Each tread bows outwards, this further accentuates the curved nature of the staircase. The final step raps around the back of the staircase as is itself a feature. With a staircase of this color, it is very important to either use the color sparingly or make sure that it is used on a light background. In this case the client made sure that all of her walls, architraves, and skirting boards are white, as well as using large quantities of artificial light. If this was not the case, the dark stairs would be absorbed into the back ground and the room would become increasingly dark.